I wake up (did I sleep? ), then enjoy a sweet Milo milky (powdered of course) drink, and a second cup this time just of hot water. We set off at 00:45, possibly the last group out of camp. It’s basically the guide’s job to estimate what time to leave so that you get up to the top at a sensible time – I think Alex has been fairly impressed with me, so most people have gone earlier, some starting at about 11pm. As we walk out of camp, Alex finds he needs to cut the straps on his gators, and of course I have my “J-A II” penknife at the ready, what a boy scout. The moonlight is bright and the sky clear as we start climbing – straight out of camp it’s almost rock climbing, being surprisingly steep. Above, we find another camping spot, which seems like a sensible place to stay, saving you twenty minutes of climbing for your summit attempt. We soon start passing people, as we hit the snow line. The powder sparkles in the moon light, it’s beautiful. Looking up, we can see lights (head-torches) dotted up the mountain, illuminating the trail. It looks like a long way, and people seem to be very far up already. My headache is thumping as we start to exert ourselves. The trail uses frequent switchbacks to keep the ascent reasonable, but whenever we get stuck behind others, Alex speeds up and cuts straight up the scree slope, myself behind, headache banging away! Apparently one of the reasons for the night ascent is because the scree (loose rock chips lying on a slope) is frozen together, making climbing easier! I’m not feeling too tired though, and Alex says those who tire easily have most altitude problems. We’ve a few hours of ascent to go, which he doesn’t tell me. We don’t stop, mainly because it’s too cold, especially when we’re exposed to the wind, which isn’t that strong, but is bitingly-cold when face on. The slope seems to get steeper and steeper as we go on, and I can feel my legs get heavier, it’s like wearing shoes with lead weights in them. You end up in a kind of trance, just placing one log-like leg in front of the other. Suddenly, I hear another group being told that there is less than 10 minutes to Stellar Point, at the top of the rim! Hurrah! And sure enough, minutes later we arrive at Stellar Point at 5685m (about the height of Everest Base Camp). People are sitting around, resting, there are perhaps a dozen people here already. Alex asks me if I want to stop. What for, a cup of tea? Nope! Strangely enough, my headache disappeared above 5,000m, replaced by a slight (perhaps psychosomatic) feeling of nausea. We charge straight on to the summit, which involves a 30-40 minute trek around the crater rim, and a couple of hundred metres climb. Alex is tiring too, and kneels down for a few seconds, head down. I carry on, but find I’m so cold I can’t speak properly, my lips don’t seem to be functioning! We circle round the large crater, lit up by the moonlight. Apparently the magma is only 400m below surface here! There is some possibility of the crater collapsing, causing an eruption! Well, at least that would warm the place up a little!! It’s truly beautiful, and we have the enormous snow piles and glaciers of the Western Breach on the left. As we climb, we are exposed to the wind more, it’s much colder here. Suddenly, we’re there! The summit! Woohoooooo!! There’s one other guy there already with his guide, though we were first from Machame. The time? 5:10am on Friday 25th January, 2008. It’s still dark, but in the moonlight we can read the sign posted by the Tanzanian government, which reads "Congratulations! 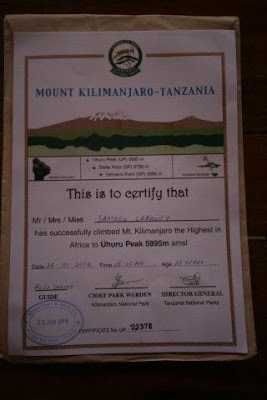 You are now at Uhuru Peak, Tanzania, 5,895 m. amsl. Africa's Highest Point. World's Highest Free-Standing Mountain. One of World's Largest Volcanoes. Welcome." The sign is covered in travel stickers from past trekkers. In front of the sign is a box supposedly containing a log book. I didn’t investigate. So, according to Alex later, I was the second fastest person he’s had ascend. It has to be noted, however, that the fastest was a Norwegian girl! So, we’re at the summit, it’s dark, freezing cold, there’s a biting wind blowing straight through us. What to do? It’s still dark! I take out my camera, try to take a photo, and to my horror receive “Flat battery” message, probably because of the cold! I had, fortunately, brought a spare battery, but swapping them over wasn’t going to be fun. I opened up my bag and rummaged, looking for the appropriate ziplock. Inside that, a small zip case, inside that, a plastic case. Needless to say, the gloves had to come off. This was not a good idea. I fumble with the camera battery compartment, every couple of seconds lifting up my jumper to jam my frozen fingers into my armpits for a boost before bringing them back out. Finally it’s done, and I grab a photo of the sign. Next, I ask Alex to take a quick photo of me. Then, with me starting to shiver, it’s time to go! We trudge back past a couple of dozen people all approaching the summit. Back at Stellar Point, we meet Andrea and the Aussie girl. They ask if I’m staying up here for the sunrise. Despite Stellar being a bit sheltered from the wind, I don’t have any of that Canadian blood in me, so no, I’m not waiting about an hour for the sun! It’s too cold! We start descending, mostly scree-sliding down, passing initially many groups coming up still, the other guides offering congratulations in their broken English (Conralasons!) to which I’d respond “Ashanti” (thank-you). Soon we’ve passed all those heading up, even a very old couple that I respect a lot for having a go, then.. peace. We have the mountain side to ourselves, as the sun starts to emerge over Mawenzi in front of us. Glorious. Alex is getting further ahead of me, as we continue sliding down the dirt and scree, the sun finally coming up. I stop to take some photos. I meet one of the American guys having another go, just starting as I approach camp, having given up last night for some reason. 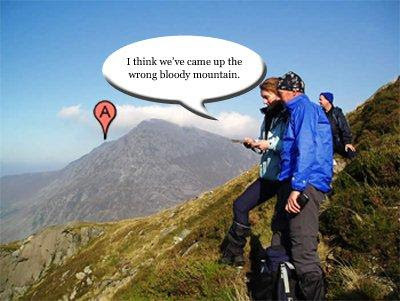 To be honest, as I said to him, having completed most of the trek, not reaching the summit wouldn’t be a disaster. I wasn’t expecting much from the trail, but it has been a beautiful four days, and even if people don’t make it up, they’re still going to have had a wonderful experience. Quickly down into camp for urgent loo stop, then at our tents, I am congratulated by crew. As I point out, it’s been a team effort. Right, time for bed for a short snooze before breakfast. After this, I can feel I’m starting to ache. Everywhere. It can only get worse! And my headache has returned, replacing the nausea. Weird! I pack my gear up, and then emerge to join the crew. August will be taking a different route down, so we stop for group photos. As you can see, Tanzanians seem to have real issues centering shots, but it’ll do! Alex tells me if I want to tip August I should do it now, which I do. I thank him for his good nature and service, and hand over 36,000s, which he seems happy with. There’s an argument between my crew and the warden staff about toilets – apparently they’d asked us to clean them, a bit of a cheek given the state they were in when we arrived. We refused, and started the long descent. I’d been using my Leki stick walking poles since starting down from Stellar Point. Only now did I think about what we had to do today if we were to exit the park – a truly enormous descent, as we’re not breaking the drop at Mweka Camp like we’re supposed to! Alex and I set off together first, leaving the others to (inevitably) catch us up. We reverse the phases of landscape – rocky, to moorland, to montane forest. I notice a strange illusion – it appears Moshi town is floating in the clouds in front of us. I realise this is because we are descending at a horribly steep rate with no visual points of reference or horizon, so the flat seems to be up in the sky! This is confirmed when I notice the plants next to the trail are growing at a sharp angle towards us. We pass High (Millennium) Camp, where I take off my warm (Merino wool) under-trousers, just as well as those things cook me unless it’s incredible cold! We enter forest – and can see Mweka Camp - it doesn’t look far but still seems to take ages down a nasty trail, very stony, steep, and with frequent badly-maintained steps. We stop briefly at Mweka, at 3102m, and Octo feeds me some fruit “for energy”. I don’t need energy, I need a new pair of knees! After this the trail is better, but involves lots of steps. I’m given a good head-start on my own, but it doesn’t last long. My knees are really starting to suffer now, after what has been 2800m descent. Only another 1300m to go! I’m trying not to bend my knees, but it’s not easy with several thousand feet of steps to conquer! It seems to go on forever, and I feel very sorry for those coming up. My map suggests that it is 4-5 hours down to Mweka and 4-5 from there to the gate. We did the combo in about 5 hours. Incidentally, it is a beautiful forest, with some enormous and very old-looking trees. I hear the cry of blue monkey again, and some Turks I meet apparently saw one. I notice a deer dashing away from me as I pass a water supply. The trail is also host to plenty of chameleons, and even a super-cute baby field mouse. In all cases I was not in the mood to stop and take my camera out, dear reader. We finally leave the trail and join a 4x4 track. As Tilman says, the sight of a horse makes the weary traveller lame, and for me, the knowledge that vehicles could convey my shattered frame down to the gate made the pains seem greater than ever! And still, the trail is endless! Later, looking at the map, it is clear that the 4x4 track is even longer than the trail down to it, so no wonder I was about to collapse when I finally reach the gate, beating Alex and Octavio by several minutes, which I enjoyed sprawled on the grass moaning! At 1649m, we had therefore descended 4246m in about 5 ½ hours!!!! Madness! I fill out the log book after a large Turkish group (another slow-walking group I learn later). I’m issued with an A4 certificate to prove I made it, then we take a combi bus back to Ahsante. I tip the guys the recommended amount, 36,000s for the porters, 50,000 for Octo as cook/assistant guide (not that I believe he had much of the latter role to do), and 72,000 for Alex as guide, plus an extra 10,000 as a “summit bonus”! They seemed happy with that. I picked up all my kit which I’d left at Ahsante, then Alex gave me a lift to Kindoroko, which was full, then round to Buffalo Hotel, which had rooms (and very noisy construction going on). The girl punished me by putting me in a second floor room. I could manage the walk up, but coming down was almost farcical! Buffalo definitely wasn’t the best hotel ever (as it had been described to me by a Danish couple), but it was still fine. I had a marvellous hot shower and shave, and did some “emergency washing” of my trekking socks, pants and trousers!! I left these to drip dry then later will hang under the ceiling fan, which should have them done by the morning. I lay down on the bed, and found it difficult to move again! I hobbled slowly downstairs, went looking for a travel agent, but they don’t appear to have this concept in Moshi, only airline offices for Air Tanzania and Precision. I hobble back for pizza and beer at Indotaliano, and by chance the English NZ couple turn up and join, so we compare experiences. They are in awe of me making it out today – they are suffering after doing the two-day exit! After a couple of beers and a glass of wine, it’s time for bed. I’ve earned it! 5 Days (I’d strongly recommend taking the 6th on the way out if you want to be able to walk the follow day) for Machame Route. Agency: Ahsante Tours (www.ahsantetours.com) , Tel: + 255 27 27 50248. Address: Plot 29-A Karanga Drive, PO Box 855, Moshi, Tanzania. Cost: 1230 US$ plus about 10% for tips. The price does scale down per person as you add numbers, but not much. Would I recommend Ahsante? Absolutely!